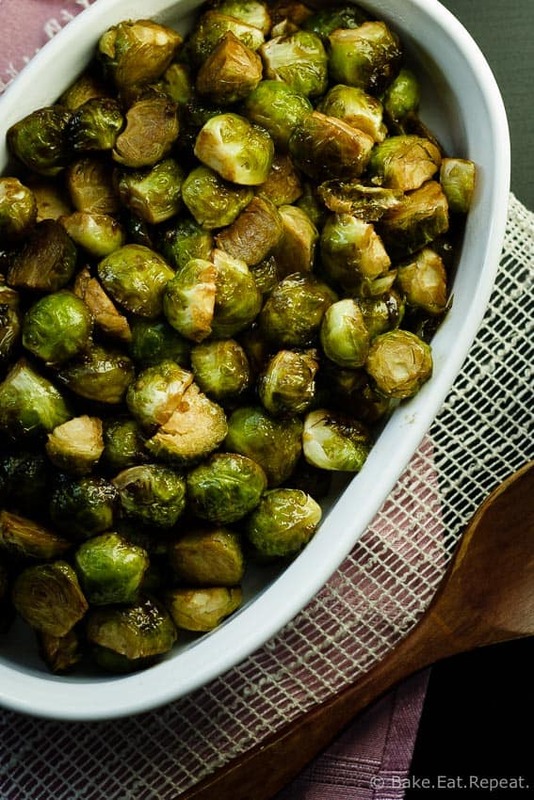 Maple balsamic roasted brussel sprouts recipe – a quick and easy side dish that is perfect for your Thanksgiving meal! Brussel sprouts have never been my favourite vegetable. Never really liked them at all if I’m perfectly honest. What is the best way to cook brussel sprouts? 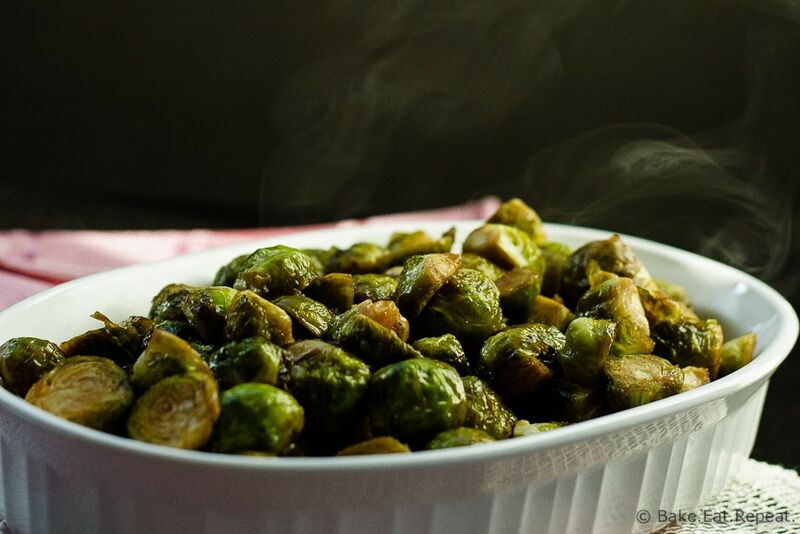 Last year I discovered the wonder of roasted brussels sprouts when I made these honey garlic roasted brussel sprouts and haven’t looked back since. My husband thinks that steaming brussel sprouts with butter is the best way to cook them. I’m firmly in the camp that believes roasting brussels sprouts is the only way to go. I still don’t particularly love them though. My 7 year old son was requesting that I make brussel sprouts so I finally made them again. Of all things. Forced into making brussel sprouts because my kid wanted them for supper. Every parents dream right? I think he was so intent on having them again because his dad told him they would make him strong so he could skate faster at hockey. I think we’ll have to start saying that about every. single. food. that he doesn’t want to try now because he was excited that there were roasted brussels sprouts for supper. Excited. My seven year old. If that doesn’t prove that this is a winning recipe, I don’t know what does. I loved the maple balsamic flavour on these brussel sprouts. I actually kept grabbing them from the dish while taking photos, they were so good. My husband thought they were too sweet, but he likes his brussels sprouts plain so that wasn’t too surprising. My son and I loved them though! So if you like a little sweetness with your side dishes, I’m sure you will love this one. Are brussel sprouts just small cabbages? I call them mini cabbages when talking about them to my kids – because you can pretend you’re a giant when you eat them. Have to make vegetables fun somehow, right? But if you’re curious, they’re not actually small cabbages, just part of the same family. With cabbages you eat the whole head of the vegetables that grows out of the ground, but brussels sprouts are buds that grow along a thick stalk. Can you eat the whole brussel sprout? Brussels sprouts keep for a couple weeks in the fridge. Smaller sprouts are usually a bit sweeter then the larger ones so look for smaller ones if you don’t like the bitter taste they can have. You can eat the whole sprout, just trim the dry part at the base of the sprout and pull off any loose outer leaves. Make sure to spread the brussels sprouts out on your baking sheet. If they’re close together and piled on top of each other you will end up steaming them more then roasting them. To get the crispy edges, they need a bit of space around them. These maple balsamic roasted brussels sprouts are fairly sweet. If you don’t want them to be that sweet you could decrease the maple balsamic mixture to half the amount called for, for a less sweet version. Here are a few more great side dishes for you: Twice Baked Potatoes with Cheddar and Broccoli, Mashed Carrots and Turnips, and Roasted Rosemary Potatoes. In a large bowl whisk together the olive oil, garlic and salt. Add the trimmed brussels sprouts and toss lightly until they are well coated. Spread on a rimmed baking sheet and roast for 18-20 minutes, tossing halfway, until tender. In a small bowl, whisk together the maple syrup and balsamic vinegar. Drizzle this over the roasted brussels sprouts and toss to coat. Roast for another 5 minutes and enjoy! Adapted from my Honey Garlic Roasted Brussels Sprouts . This post contains affiliate links, meaning that if you make a purchase through these links, I may receive a small commission. I am a participant in the Amazon Services LLC Associates Program, an affiliate advertising program designed to provide a means for us to earn fees by linking to Amazon.com and affiliated sites. Chose this recipe again for our Thanksgiving supper, delicious! Again, everyone said they were so good!! I made this recipe last thanksgiving and had rave reviews, there weren’t any left to use for leftovers. Planning to make them again this year, I know they will be a hit. Has anyone actually TRIED this recipe? It looks good and I'd like to hear from others on how it turned out for them. Hi Katie, I haven't heard from anyone yet that has tried it - but I did get some feedback for the honey garlic roasted brussels here and on Facebook about how good they were. These maple balsamic ones are an adaptation of that recipe. If you do decide to try either of them out I would love to hear how you liked them - as would others I'm sure! :) Thanks for stopping by. I wish my kids would eat brussels sprouts! They're my favorite - I can't wait to try your recipe! Right?! Always a nice surprise when the 7 year old wants a vegetable dish of any kind, let alone brussels sprouts! Thanks Erin! I definitely had to "grow into" loving Brussels sprouts, and I definitely do! Your version sounds so good - I've never seen them with maple syrup. Nice!! I'm glad they'll be around a while - look forward to trying these! Love using sweetness with brussels sprouts. These look like the perfect Brussels! Kid you not, I tried brussels sprouts for the first time about a year ago and I'm HOOKED now! I prepare mine with honey and balsamic vinegar. Pretty similar. These look just delish! I think roasting Brussels sprouts will sway almost anyone to liking them. I love the maple and balsamic though, such a great addition! I do enjoy them a lot more when they're roasted! And maple balsamic is good on most things! :) Thanks Erin! Haha, yes, approval from a seven-year-old boy is proof of a winning recipe but I didn't need it for this dish. The recipe sounds delicious and the photos look beautiful; I love that steam, makes it look so warm and inviting! Hey Stacey! As much as our family really enjoys Brussel Sprouts with Bernaise Sauce, we also enjoy them just a teeny bit on the crunchy side too. We're trying to get away from so much butter in our diet, and this looks like a much better alternative for us, as well as looking awfully tasty! Can't wait to try them ... maybe for our Christmas dinner this year! roasting makes everything better, isn't it? Sounds yum! Roasting definitely makes everything better. It's my favourite way to cook veggies for sure! Thanks Manali! LOL! How funny, a kid asking for brussels sprouts!! I don't blame him though-- these look SO YUMMY! They're def one of my favorite veggies! Right?! I think it's so funny, especially since he's a bit of a picky eater generally! Oh well, I'll take it! Thanks Jess! 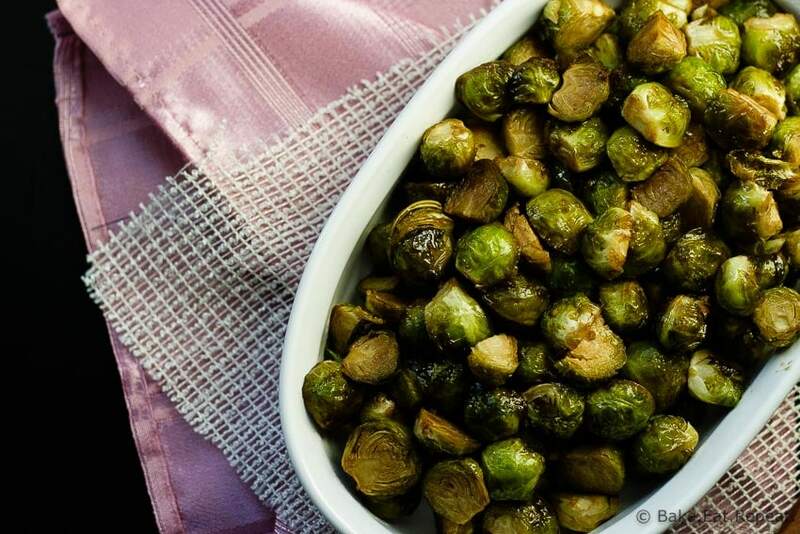 These brussels sprouts look incredible- what an awesome Thanksgiving side dish- pinning!